James Winfield "Win" Wilkey married Minnie Weir and spent their early years in Thurman Township, Sullivan County, In. Win was the son of Burton Wilkey, who was the son of Dennis Wilkey. Dennis was one of the original Wilkey brothers who settled in the Mt. Tabor community, five miles west of Sullivan. The Wilkey family moved to Monterey, Ca. Win and Minnie had seven childred. Their daughter, Helen, lived in Califorina and was buried there in Monterey. Loran married Louise Setzer and had two children: John and Janet. Louise is now deceased as well as their daughter, Janet. Eugene married Geraldine Lamb and is buried in Monterey, Ca. Carl was married and has a daughter, Shawna Wise. Hester married Harold Newlain and has a daughter who lives in Terri Haute. Merle was married and lived in Los Gatos, Ca. and has two children. 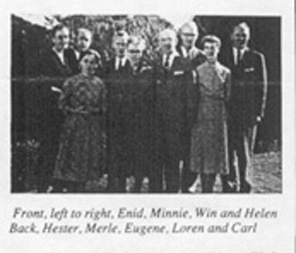 Win and Minnie's youngest daughter, Enid, was buried in Monterey, Ca.